I recently bought the rubber scoreboard from the CarcassonneShoppe because it's much more portable than the regular scoreboard. Since I've done a lot of backpacking in the past and hope to do more in the future, that got me thinking about creating a Carcassonne Travel Set - a minimalist set that you could travel with but (unlike the Travel Edition) which still gives you some expansions to switch up the game a bit. - Attempt to limit extra pieces/tokens where possible (i.e. no Traders and Builders). I would probably bring a maximum of four sets of meeples with a phantom for each. The Besiegers (6 tiles): I love the siege expansions and the four tiles of Cathars or Siege would be more economical, but they break my 'no rare expansions' rule. So, Besiegers it is. It's still only six tiles and it doesn't come with any extra pieces. German/Dutch Monasteries (6 tiles): Another small expansion that I like that doesn't come with extra pieces. It's very powerful in a small game but maybe there could be a limit on how many abbots each player could place. Abbey and Mayor (12 land tiles plus only 4 abbeys - 16 tiles): A 'controversial' choice because it adds a lot of wood (barns, wagons and mayors) but I think it's worth it for the many elements that A&M offers. That brings me to 100 tiles exactly to complete my set. Other expansions that I strongly considered were the Flier, King and Robber Baron, and Mage and Witch. 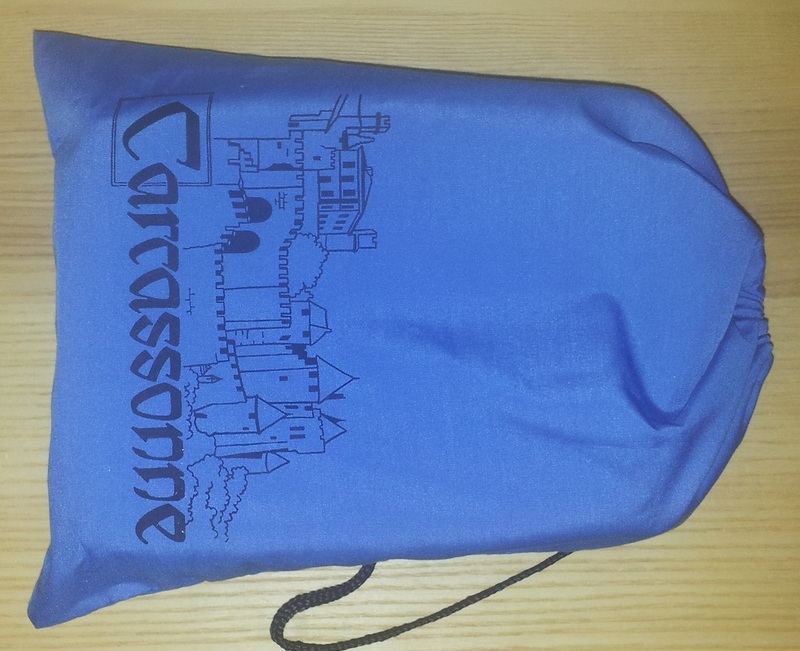 What would you include in your Carcassonne Travel Set? I've been thinking about asking Basically Wooden if they may be able to construct something to help with this. 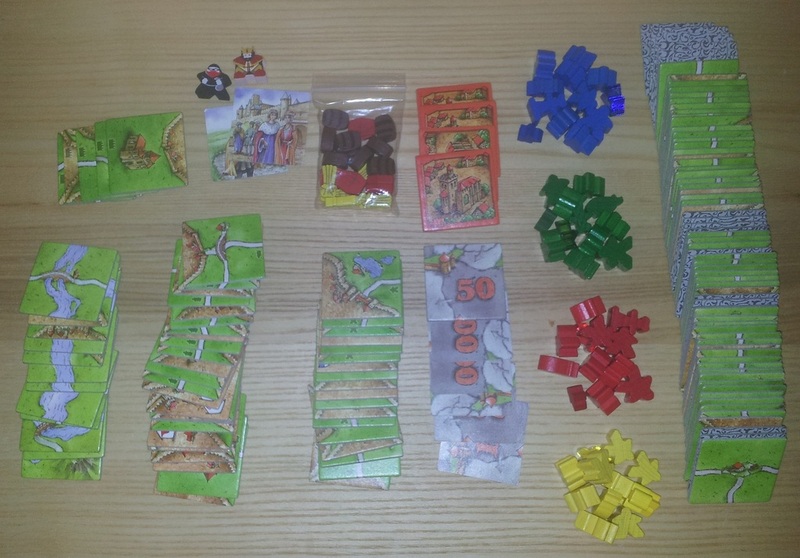 A Carcassonne travel box. 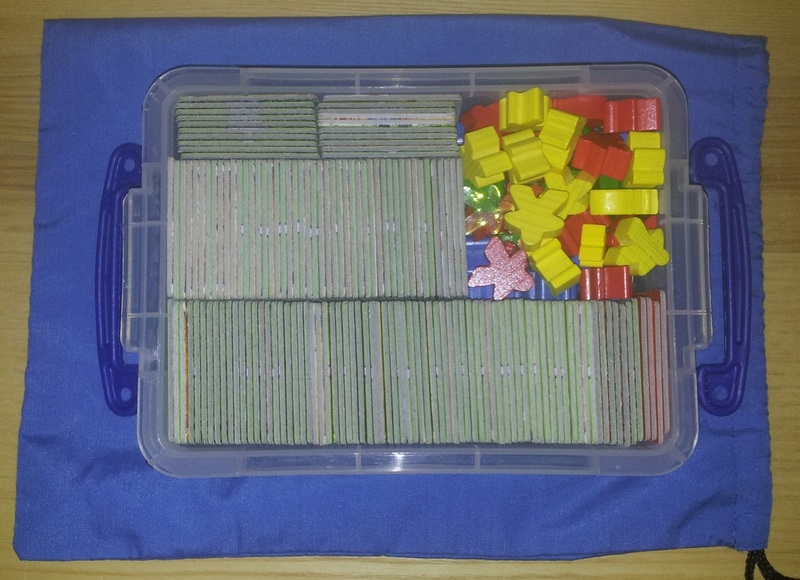 A single tower for tiles (maybe two short ones) and a small box for meeple attached at the bottom. Maybe the score track could bo on the back of the box. I think I could bring the basic set, gq11, River 1 or 2, and 5 tiles Shrine. Are 101 tiles, but if we remove the tiles initials, those are only 98 playable. I would bring in addition to the normal set of followers small (taken from the travel version) a follower normal in every color (which in this case would be the large follower and a phantom. That would be cool if they could find a small scoretrack solution. Personally I wouldn't need my 'travel set' to be in a beautiful wooden case, but if they make one that looks good and is purpose-built to be as compact as possible ... why not? How interesting that not only did we choose completely different extra tiles, but it seems that we had a completely different thought process. I ruled out GQ11 and any river straight away because I think they just add tiles but not extra elements, and I was trying to create as many different combinations of gameplay as possible. I thought about Shrine but didn't think it added as much as Besiegers or Monasteries. I put in the river because it provides a large variety at the start of the game. I have not included expansions to a thought that I did, traveling could happen to play with someone who does not know the game, too many rules can be hard to remember. The robber (8 ) or the flyer because it adds only a dice. The robber ( or the flyer because it adds only a dice. I would prefer to have everything in a hard case to guard against damage. You are so generous I was only thinking of myself! Great post jungleboy, it's been really interesting reading people's thoughts on this. Short story long: I was in a stationary shop recently. My wife was looking at something or other so inevitably I got bored and wondered off to see what I could see. And what did I see on this occasion? Lots and lots of little boxes! I ended up buying one which looked like it would be good for storing Carcassonne tiles when I'm away from home (not that this happens very often but still). So, whilst I'm knowingly violating the rules that you set out initially (the 100 tile rule anyway), I thought I'd post about it anyway. Everything fits inside the box (just) and the box fits neatly inside one of the smaller tile drawing bags. The easiest thing to do for a travel set scorecard would be to use a Cribbage board. The Wheel itself would be taken as the start tile instead of a scoring track - I'd go old school and use a pencil and a piece of paper. An eclectic mix which would certainly test the old grey matter. A copy of the Wheel of Fortune start tile would of course be made and then cut in quarters and then using sticky tape it will open out like the board for Lords of Waterdeep. I see two small areas for improvement - I think the box could be a little smaller; so the trays move around less. I'm also wondering about some type of lid for the trays. Oh cool, it's great to see this, thanks for posting it. I agree that the width of the box should be shorter to hold the trays more snugly. Maybe they thought they needed the extra space for the scoreboard? I think the scoreboard is great, by the way. I've bought everything Basically Wooden has produced for Carcassonne and I'm interested in this too. I also expect to be doing some long backpacking trips in the coming years, so I have to decide if a travel set is a luxury I can afford to bring with me! I also expect to be doing some long backpacking trips in the coming years, so I have to decide if a travel set is a luxury I can afford to bring with me! I think you meant to say: "I have to decide if a travel set is a luxury I can afford to NOT bring with me!" The logic on sizing was there's finger room. Perhaps a foam spacer, or wooden chock, would keep it snug. Any thoughts on vertical height? I dont really want to tile to drop when I turn the box over. I feel like the trays need a snug lid, but still suitable for the dividers.